A role-playing game from the Bravely Default team is being developed exclusively for the Nintendo Switch. They have brought a new world to life through a mix of CG, pixel art, and "HD-2D" visuals. One of the best modernized SNES-era-JRPGs out there. Comes very close to a masterpiece, but falls just short. This is everything I wanted FFXV to be. This game is a shining example of how to take an SNES-era style JRPG, bring it up to date with modern JRPG mechanics and mix in a few Western-RPG game mechanics. It's a perfect mix of charming story telling from Dragon Quest, Sprite/Character art from SNES-era Final Fantasy, Press-turn-like battle system from Shin Megami Tensei, and Class system from Bravely Default. It may seem like I wrote a lot about what I didn't like, but this is I enjoyed the game so much and found that it did things so well that it was obvious to point out where it fell flat. I'm always a fan of very stylized graphics/art style (Wind Waker, DQ8), as I believe these hold up much better than standard graphics/art style. The character sprites look great, monster and boss art is interesting, environments are beautiful. The battle system as a whole is really satisfying. 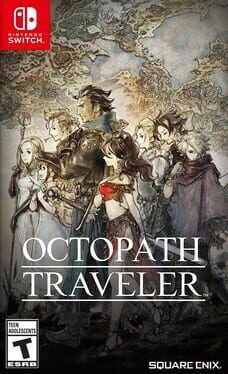 While I do think it is a step down from Bravely Default, I still think it's a great take on a modern turn based system. The boost/break system allows for some really challenging and almost puzzle-like boss fights - where you have to balance between using your BP to break the boss faster or save it to deal out the most damage after you break the boss. As someone who gets overwhelmed by all the quests and collect-a-thons in modern console games (Wither 3, Assassin's Creed, Horizon Zero Dawn), I found it really refreshing how bare bones the quest system is. I love that there's no way points to lead me to the next step in the quest. I love that you actually have to read what the NPCs are saying to know what to do for the quest. I love that you have to think about which character's field ability you have to use to solve a particular quest. I'm a sucker for games with classes (like FF5, DQ7, Bravely Default, Etrian Odyssey) and this game does not disappoint. There's not as many classes as in something like Bravely Default, and you can't customize each character as much (you can only change their sub class and 4 passives), but the classes are well balanced and each one is useful in battle in some way. There's still enough customization that you can build your party to defeat challenging bosses in different ways to capitalize on your party's synergies. Story-wise, the main problem with the game is that there is not really a central plot. The driving force of the game comes from the player's interest in the 8 mini-stories. The mini-stories are not terrible, but they are not great - and most definitely not on par with even the side stories of characters in games like FFVI or DQ7. For people who value a great narrative, I could see how this could be a huge turnoff. Unless people are drawn to the gameplay mechanics, I imagine most people will just complete the stories of the few characters they like. Plot and character interaction often go hand-in-hand. The fact that there is no central story to bring all these characters together means that they don't have the chance to have arcs together. The force of change in each character is the series of events that happen to them in their mini-stories. There are some mini-scenes similar in form to skits from the Tales series, but they are often only between two characters, we never learn anything new about the characters, and even the characters don't really learn anything new from these interactions. You start off each battle with 1 BP and you can only boost by as much BP you have. This is my main major complaint with the battle system. I really wish that they would have taken the Brave/Default system from Bravely Default. This makes random encounters a slog, since you can't just 4x boost every character and defeat the enemies in one turn as you can in Bravely Default. One thing that I really would have loved is some way to completely turn off the random encounters - ideally the encounter rate slider from the Bravely Series. There is a character ability to reduce the encounter rate, but I really wish that I could get rid of them completely. I enjoy the environments so much that I really would have liked to walk between most locations, but I found myself fast travelling to avoid random encounters. There's really no excuse for a modern JRPG to not have a beastiary of some sort. It's good that the enemies have their weaknesses displayed under them in battle, but I would have preferred an in game compendium containing more info about each enemy. One of the 8 characters talks in what seems like an attempt at Old English(?) and it just makes things harder to understand and adds nothing to the character. It's enough to make me never use her in my party and only begrudgingly go through her chapters.